Robert Lighthizer: "We are in a position where we're finally starting to converge." WASHINGTON — The United States has confirmed a breakthrough in the NAFTA negotiations unlocking a major irritant involving automobiles, while stressing that a few remaining disagreements need to be settled before a deal is concluded. A sense of optimism that the unofficial No. 1 issue in the NAFTA talks might be close to resolution lifted the Canadian dollar more than a cent Wednesday, while the U.S. trade czar confirmed the positive developments on autos. "We're finally starting to converge," Robert Lighthizer said, while delivering a progress report to the U.S. Congress. "I think we're in a pretty good place." The U.S. is pushing for a deal within weeks. Otherwise, the process risks being punted into 2019. By mid-spring, it will be too late to complete the legal steps that would allow a ratification vote in the U.S. before midterm elections usher in a new Congress. Lighthizer summarized the state of the talks this way: "I believe that we have made a great deal of progress — but we still have a ways to go. I have urged our trading partners to recognize that time is short if we are to complete a deal in time for consideration by this Congress." Prime Minister Justin Trudeau said Wednesday he believes that a deal is "eminently possible." "There seems to be a certain momentum around the table now that I certainly take as positive," he said at a Toronto news conference. That said, serious irritants remain. The blunt-spoken Lighthizer minced no words while listing several of them — he referred specifically to Canadian policies on dairy, culture, wine, and intellectual property. Dispute settlement rules and Buy American issues are also sticking points. "It's difficult for them to change their policies in these areas," Lighthizer said. "Having said that it's a very high priority to make changes in the Canadian dairy programs. ... I'm hopeful that when we put the final deal together it's something we will make real headway on." Trudeau suggested that will mean a fight: "We're going to continue to defend supply management, because it works." 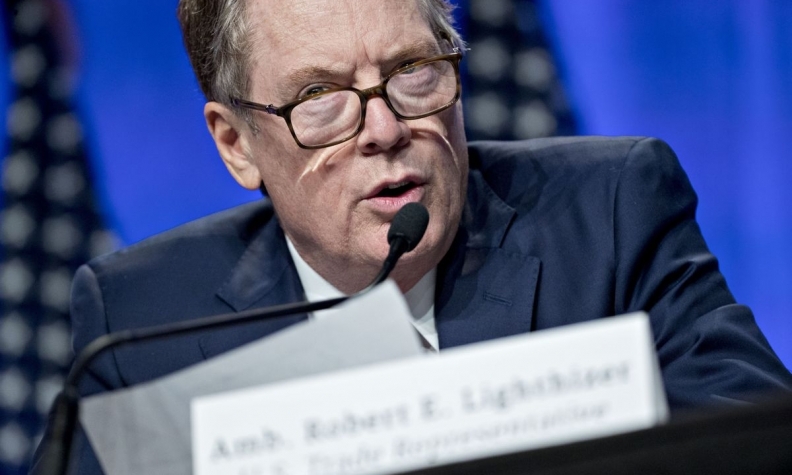 Lighthizer predicted how the final hours of bargaining will unfold: he said the last issues to be sorted out will include sensitive agricultural areas, such as dairy and wine, as well as intellectual property. But he said he envisions a new NAFTA with 33 chapters — up from the current 22 — that benefits every country. He said his primary goal is to steer back some manufacturing from Mexico, through several means: driving up wages in Mexico, new auto rules and weakening the investor-state protections that allow companies to sue foreign governments under Chapter 11. "The Canadians, to be honest, have a similar objective," Lighthizer said.